The Samsung Galaxy S10 Lite will be powered by Qualcomm Snapdragon 8150 SoC. The year 2019 is going to be a busy year for Samsung. While we are expecting the much-hyped Galaxy foldable smartphone in the coming year, the company is also said to release its flagship smartphone the Galaxy S10. Now, some new reports suggest that Samsung will also introduce a Lite variant of the Samsung Galaxy S10. The new variant which is expected to be launched by the company will be the first Lite variant of the company's flagship lineup which will offer a similar performance but with a much lower price tag. One of the major highlights which the Galaxy S10 Lite is that the device will ship with a flat Infinity-O display which will be paired with a metal frame encasing comprising of a side mounted fingerprint reader. We already have seen the company's recently launched Galaxy J6+ with a similar side mounted fingerprint scanner and it is placed ideally where your thumb will rest while picking up the device. Apart from the aforementioned features, the Galaxy S10 Lite is said to sport a dual-lens rear camera setup which will be stacked horizontally. This contradicts the earlier reports which had suggested that the device will feature a single rear camera module. 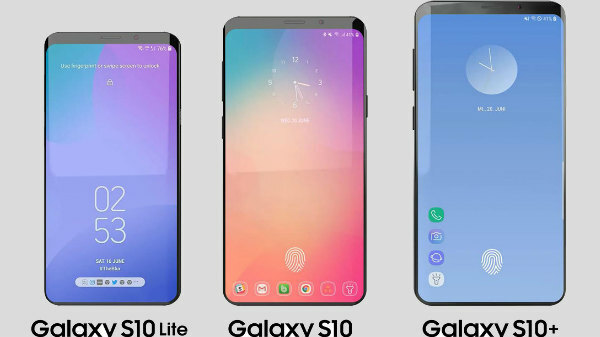 As for the specifications and features, the upcoming Samsung Galaxy S10 Lite will be following the footprints of its siblings, i.e, the Galaxy S10 and the Galaxy S10+, and will be powered by Qualcomm's Snapdragon 8150 SoC. The Snapdragon 8150 processor will be clubbed with either 4GB of RAM or 6GB of RAM, users will be able to choose any of the desired variants. The device will be available in standard 64GB of internal storage, however, users will be able to get the 6GB RAM/ 128GB storage variant of the device by shelling out some extra bucks. As for the pricing and availability, it is expected that Samsung will unveil the Galaxy S10 Lite in February during the MWC 2019 along with the Galaxy S10 and Galaxy S10+. The device is expected to carry a price tag between $650 (Rs 47,141 approx) and $750 (Rs 54,393 approx). Samsung is yet to make any official announcement regarding the same and it remains to be seen at what price bucket Galaxy S10 Lite will come.